On this date in our family history . . . the 29th day of April . 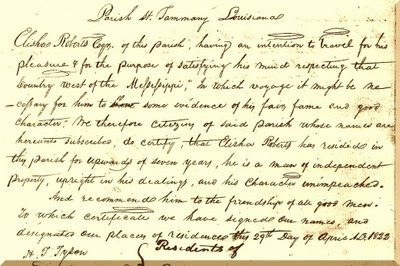 . . in the year 1822 . . . a letter of reference is drawn up in St. Tammany Parish, Louisiana for our Elisha Roberts (c.1774-1844) in preparation for his planned trip into the area we now know as East Texas . . . This Elisha is a 4th great-grandpa to the Keeper of this family history timeline . . . click > HERE < to view a scan of the three-page letter of reference which was shared by our cousin, Diane Baldwin . . .
Labels: 19th Century, Hall Kinfolk, Louisiana, Maternal Kinfolk, Memes, Month of April, Roberts, San Augustine Co.
On the 29th day of April . 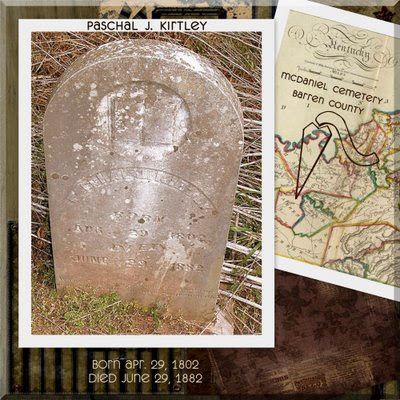 . . in the year 1802 . . . Paschal Jefferson Kirtley is born in Warren County, Kentucky . . . this P J Kirtley is a 3rd great-grand-uncle to the Keeper of this family history blog . . . in January of 1826, he marries Mary Ella McDaniel (1809-1873) . . . and in November of 1826, following the deaths of both of his parents, he is made legal guardian of his three younger sisters . 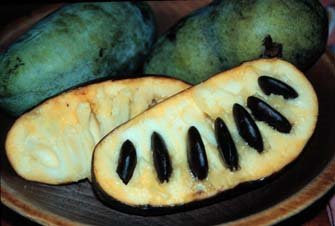 . . about 1827, his wife gave birth to the first of at least ten children. I first met this man and his family back in the 1990s while searching census records at a local library . . . I was looking for some clue as to the parentage of my 2nd great-grandpa, William Paschal Henry (1836-1912) . 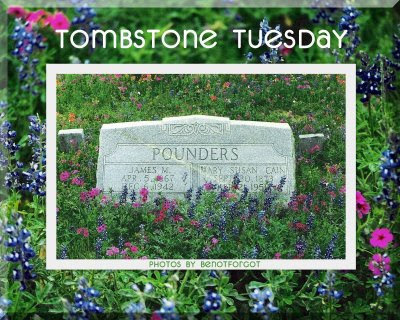 . . whose remains reside in the Murray Cemetery in Milam County, Texas . . . and I found a 14-year-old William P. Henry enumerated in the Paschal J. Kirtley household on the 1850 Census for Barren County, Kentucky . . . my first feeble attempts at establishing a connection between the Henry and Kirtley families were unsuccessful . . . but once I began conducting genealogy searches online, I was able to locate a few Kentucky marriages between Kirtley women and Henry men . . . including an 1835 Barren County, Kentucky marriage record for a Thomas Henry and a Mary Kirtley (one of the orphaned sisters) . 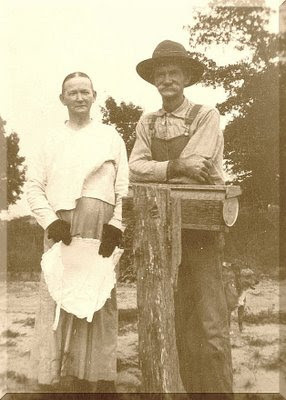 . . and they wound up being the 3rd great-grandparents I was looking for! So . . . Thank you, Uncle P.J., for watching out for your little sister (my 3rd great-grandma), Mary, and for helping take care of her son, William P., after his father died. On this date in our family history . . . the 28th day of April . . . in the year 1317 . . . Margaret de Clare (widow of Piers de Gaveston) becomes the bride of Hugh de Audley at Windsor Castle in England . 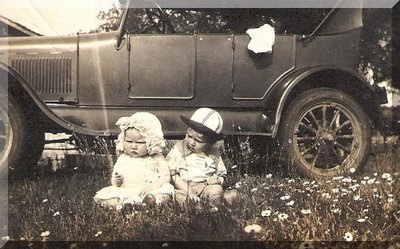 . . this Margaret and Hugh are believed to be 20th great-grandparents of our Josephine . . . who is a 2nd great-grandma to the Keeper of this family history blog. Complete peerage of England, Scotland, Ireland, Great Britain and the United Kingdom, extant, extinct, or dormant By George Edward Cokayne: " " In Archaeologia Cambrensis (1883), John Skinner, Cambrian Archaeological Association, says that . . .
Hugh de Audley, whom Margaret next married, was son of Hugh, a cadet of the Barons Audley, of Heleigh Castle. 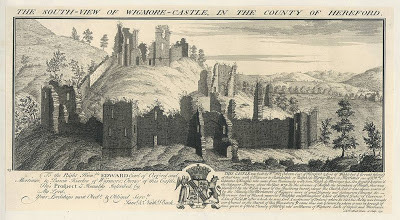 She was then styled widow of Piers Gaveston, and having become a coheiress, she had by partition, llth Edward II, the castle and tower of Newport, the manors of Stowe, Rempney, Dyneley, and Maghay, the hamlet of Frenebothe (Ebbw), and the commote of Wentloog. Thornbury also came to her, and Tonbridge Castle, and much English property. Thus the Monmouthshire portion of the lordship was cut off from the Glamorgan part. 15th Edward II, Audley was in arms for Thomas of Lancaster, and was taken at Boroughbridge, but pardoned owing to his wife's interest. For further information, see also . . .
By Everett Schermerhorn Stackpole: " "
In the book, Old Church Lore by William Andrews (1891), the author states that . . . In America, the Puritans made some very curious Sunday laws. Walking, riding, cooking, and many other natural needs of life were forbidden. Sports and recreations were punished by a fine of forty shillings and a public whipping. In New England, a mother might not kiss her child on a Sunday. . . . the captain of a ship, who, on his return from a long voyage, met his wife in the street, and kissed her, and for the offence had to pay ten shillings. Another Boston man was fined the same amount for kissing his wife in his own garden. The culprit refused to pay the money and had to endure twenty lashes. . . . In past ages, attending church was not a matter of choice, but one of obligation. . . .
See also . . . Early days of church and state in Maine (1910) by Robert Hale (1889-1976) . . .
On the afternoon before St. George's Day, 1376, April bloomed in Warwickshire. The young lambs bleated from the pastures beyond the mere, while a hazy gold light turned the sandstone of the battlements to the color of a robin's breast. All Kenilworth Castle, cleansed & garlanded for the festivities, waited for the Duke to come again. Katherine sat on a sunny stone bench in the Inner Court near the old keep . . .
Katherine . . . that's the name of the historical novel the above excerpt is from . . . written by Anya Seton (1916-1990) . . . and published in 1954 . . . Katherine is still read and enjoyed and discussed by many . . . and according to current research, it does appear that this same Katherine is a 16th great-grandma to our Josephine . . . who is a 2nd great-grandma to the Keeper of this family history blog . . .
On this date in our extended family history . . . the 22nd day of April . . . in the year 1864 . . . thanks to the efforts of U.S. Treasury Secretary, Salmon Portland Chase (1808-1873) . . . the motto "In God We Trust" is approved for US coinage (Coinage Act of 1864). The first coin actually minted to have the "In God We Trust" motto was the 1864 two-penny piece. 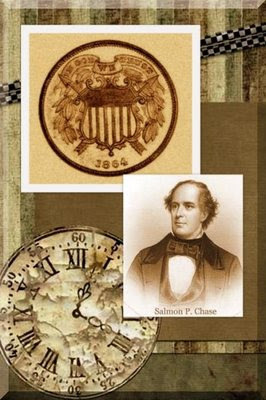 This Salmon P. Chase is a 4th great-grandson of Aquila Chase (1618-1670) and Anne Wheeler (1627-1687) . . . who are 6th great-grandparents of our Phoebe . 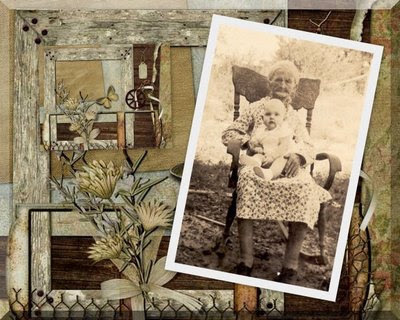 . . who is a 2nd great-grandma of the Keeper of this family history blog . . .
On this date in our extended family history . . . the 21st day of April . . . in the year 1910 . . . Samuel Langhorne Clemens dies at his home in Connecticut . . . this Samuel, aka Mark Twain, is a 4th cousin to our Josephine . . . who is a 2nd great-grandma to the Keeper of this family history blog . . .
An interview with Twain was published in 1881 which was entitled, Mark Twain's Preparations for a Possible Encounter With the Comet . . . and he is often quoted as making the following statement sometime in 1909 . . . I came in with Halley's Comet in 1835. It is coming again next year (1910), and I expect to go out with it. It will be the greatest disappointment of my life if I don't go out with Halley's Comet. The Almighty has said, no doubt: "Now here are these two unaccountable freaks; they came in together, they must go out together. 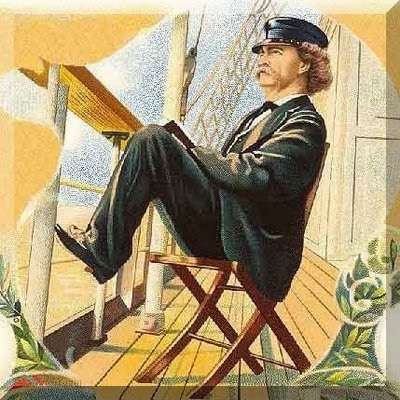 TwainQuotes.com says that, "The visibility of Halley's Comet at the birth and death of Mark Twain is an exaggeration," and then makes reference to an essay by Louis J. Budd entitled Overbooking Halley's Comet . . . the link they provided is no longer working, but I was able to find the following text at the archive.org website . . .
Hagiographers of Mark Twain like to have Halley's Comet streaking across the sky when Samuel Langhome Clemens was born and then again when he died. This conjunction especially impresses people with a weakness for astrology. But Twainians should give that comet a rest (or stifle it with some stock‑phrase that better fits such a fast‑moving object). Already warned about the pains in his chest, Twain himself helped start the gaping by declaring in 1909—according to A.B. Paine—that "I came in" with Halley's Comet and "I expect to go out with it." He did so only if we arrange the facts loosely. Crucial to those facts is: what dates the coming and going of that comet? The sun is its hub; as Twain might say, it hardly suspects our earth of being in the universe at all. Astronomers use perihelion as one of the pivotal (no pun) dates of its schedule. That's when its orbit comes closest to the sun. However, rubberneck fans of the comet date its fly‑bys by its visibility without a telescope. In Twainian circles that usually means, furthermore, visibility from our northern hemisphere. In 1835 such visibility began in very late September, peaked on 9 October in England, and faded out before the end of that month. (Track "Comet" through the precisely indexed London Times.) An astronomer in New England calculated that visibility would peak there on 16 October. (Scan the New York Herald, available on microfilm, for the low level of interest in the United States.) Perihelion occurred on 15 November, and the next Clemens baby arrived on the 30th. In 1910 the earliest, dim sighting without telescope was claimed for 29 April. Visibility in New York City—at a commuting distance from Redding, Connecticut—peaked on 18 May. Twain had died on 21 April, the day after perihelion. To book Twain for a round trip by the criterion of the comet's closest approach to the earth, equal opportunity would have to include anybody born in the northern hemisphere up to at least six weeks before or after mid‑October 1835 and dying within the month before or after 18 May 1910. We don't need demographies to suggest that many women and men would have qualified for boarding‑passes. (As for how many when the best telescope was used—sheesh!) Halley's Comet was not Twain's unearthly Air Force One. There's enough that is unique and even uncanny about Twain without our hyping the facts. In sober truth he had—to bowdlerize Twain—a "quadrilateral astronomical incandescent" career. The reunion of tomorrow . . .
On this date in our family history . . . the 21st day of April . . . in the year 1950 . . . Mary Susan Pounders dies in Houston, Harris County, Texas . . . this Mary Susan is the mother of Jacob Edmund Forrest Pounders (1902-1957) . . . aka Pa Jake . 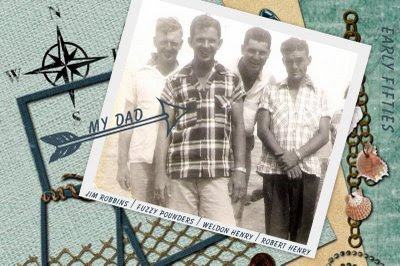 . . who is the paternal grandpa of the Keeper of this family history blog . . . It is said that Mary Susan was born the 30th of September 1873 in Franklin County, Alabama . . . and Isaac Cosby Cain is said to be her father . . .
Based on information in her mother's (Sushannah Holland Cain) application for a confederate pension, it was reported that Isaac Cain died in 1863 at Vicksburg . . . more than 10 years before Mary Susan was supposedly born . . .
1850 Census :: Eight-year-old Susan Holland (Mary Susan's mother) is enumerated with her parents and siblings in Franklin County, Alabama. I have not found Isaac Cain in 1850 -- unless he is the 17-year-old living in Pontotoc County, Mississippi? 1860 Census :: I find Isaac and Susan (Holland) Cain in 1860 living in Marion County, Alabama. 1870 Census :: I have not yet been able to find Mary Susan's mother on the 1870 Census. As a matter of fact, several members of the Holland family are MIA for this census. I did find a Thomas Cain of the right age -- living in 1870 in Tishomingo County, Mississippi (next door to Franklin County, Alabama) with the head-of-household named James Turner. Is this Susan and Isaac's son? 1880 Census :: On the 1880 Alabama Census Mary Susan appears in Alabama as a 7-year-old (born 1873) living in Franklin County with her 18-year-old brother, Thomas . . . and their widowed mother, Susan Cain, is head-of-household. 1900 Census :: Mary Susan is married and living in Texas with her husband and children. It is said that Mary Susan's mother, Sushannah, came to Texas with them when they left Alabama about 1896 . . . but I have not been able to find Sushannah on the 1900 or 1910 or 1920 census records . . . she does appear as Susin Cain on the 1930 census in Lee County, Texas, living with her daughter and her family . . . please do let me know if you have any suggestions or input on this family . . . 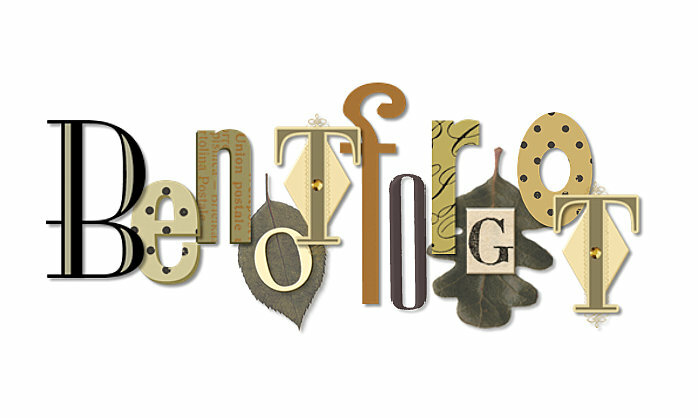 The above family poem was composed by me in response to a challenge posted at Genea-Musings: Saturday Night Genealogy Fun - Poetry and Genealogy . . . and the Wordle (name cloud) was created at wordle.net . . .
On this date in our family history . . . the 9th day of April . . . in the year 1137 . . . Duke / Count William X of Aquitaine dies while on pilgrimage to Santiago de Compostela . . . on his deathbed, he expresses his wish to see King Louis VI of France as protector of his fifteen-year-old daughter Eleanor . . . and to find her a suitable husband . . . Louis VI accepts this guardianship . . . and marries the heiress of Aquitaine to his own son, Louis VII . . . this William is believed to be a 23rd (et al) great-grandpa (via Eleanor) to our Josephine . . .
A short course of history Second Series ... IV. Greeks and Mahomentans. V. History of the Middle Ages ... By Havilland Le Mesurier Chepmell: " "
Esther and the Keeper of this family history blog both descend from Mahala Lee Sharp Hall nee Roberts . . . Vickie from Mahala's 1st marriage . . . and Esther from Mahala's 2nd marriage . 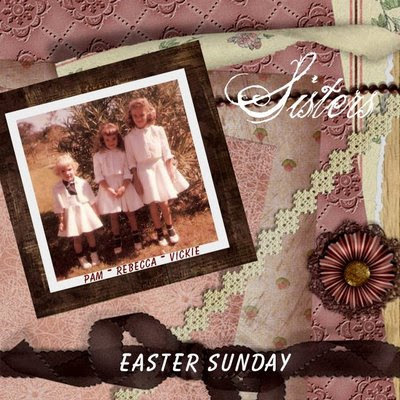 . . and today, the 9th day of April, is cousin Esther's birthday . 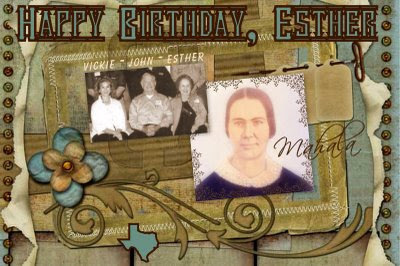 . . in Esther's own words (from another genealogy site), here's a little info about the birthday girl . . . I was born in the Baptist Memorial Hospital on Lamar Street in Houston, Texas. I grew up in the historic Houston Heights. As a young child, I would go to town on a street car. My father Horace Edwin Hall worked downtown in a large furniture store. My mother had been a teacher before she married my Dad. I have her to thank for always teaching me. She read me a Bible story each night, and I would have to tell the story back to her. From this training, I became a good story teller which has blessed me all these years. My years of growing up were in the depression years. From this background, I learned the value of a dollar which has been another blessing for me. I attended jr. and senior high during World War II. May 1945, I graduated from John H. Reagan. I attended the University of Houston and got a degree in education. I taught school in Houston and married John Biggers in 1950. We had four children and they are all grown with each having many college degrees. I taught school for 34 years mostly here in Lake Jackson . . . first and second grades. I play the piano, sing in the choir, I am a clown, a Sunday School teacher, and member of four genealogical groups -- the DAR, DRT, 1812 and UDC. I have a strong loving faith in my Lord and Saviour Jesus Christ. He keeps me and guides me each day. Most of what I know about Mahala and all of her kith 'n kin is because of cousin Esther . . . she is the one who introduced me to James Madison Hall (1819-1866) and his Journal . . . and there is a whole passel of us kinfolk who are most grateful for the time and effort she put into her research . . . and her extensive knowledge of our family history . . . and her willingness to share what she worked so hard to find . . .
Hope you're having a wonderful day, cousin Esther! On this date in our extended family history . 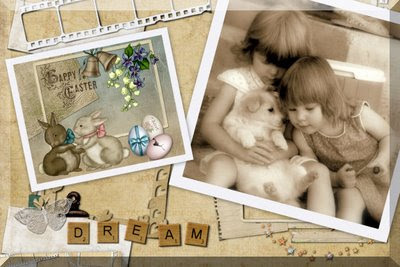 . . the 5th day of April . . . in the year 1908 . . . future actress, Bette Davis, is born in Lowell, Massachusetts . . . Bette is said to be a 23rd great-granddaughter of Eleanor of Aquitaine . 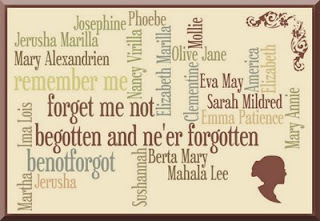 . . who is thought to be a 22nd great-grandma of our Josephine (1842-1899) . . . who is definitely a 2nd great-grandma to the Keeper of this family history blog . . .
My favorite Bette Davis movie happens to be one of the last ones she was in -- The Whales of August -- which was filmed on location in Casco Bay off the shore of Portland, Maine . . . the film was shot a few miles down Casco Bay from the site of David Berry's family cottage on Peaks Island, from where, in fact, the characters and story were drawn when Berry wrote the original play that was the basis for this movie . . .
We have photos of my maternal grandma -- Elizabeth Marilla Henry nee Smith (1912-1932) -- on holiday on Peaks Island . . . said Island was once owned by one of our Elizabeth's 8th great-grandpas -- Michael Mitton (c.1617 - c.1661) . . .
. . . Peak's Island in Casco Bay is just two miles from downtown Portland. It once was owned by Michael Mitton, son-in-law of Portland's first settler, George Cleeve. According to legend, Michael was out alone fishing in his dory when a triton swam up to his boat. Michael tried to fend off the monster with an oar, but the triton grasped hold of the side of the dory. Afraid that the triton could capsize the little boat, Michael seized a hatchet and, with one mighty blow, severed both hands of this son of Poseidon. To his horror, Michael Mitton saw that the monster's hands remained fastened to his boat. He could not pry them loose. It was then that Mike heard the haunting sound of the triton's conch, and at the sound, the severed hands gave one mighty effort at rocking his boat, finally flipping him into the water and swamping the dory. 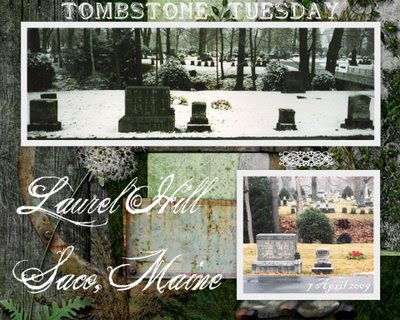 Michael drowned that day. . . . from Haunted Maine by Charles A. Stansfield, Jr. The ancestry part . . . believed to be true . . . The death scene . . .